If you want to truly live like a local in Europe, go shopping! Join the natives buying their daily produce, cheese, bread, fish, fowl, and meat and you’ll get an authentic glimpse of people living life well and enjoying a sense of community. Here are three of our favorite markets in Europe—plus villa picks nearby. 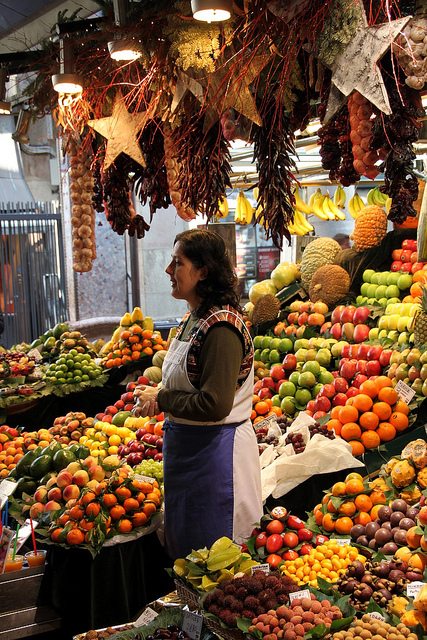 The historic Mercat de San Josep de la Boqueria market is a large public market in the Ciutat Vella district. Truly a feast for the senses, la Boqueria offers all varieties of produce, from fruits and vegetables, to candy and pastries. It has an entrance from Las Ramblas, a long tree-lined pedestrian mall between the Barrio Gótico (Barcelona’s 14th century Gothic quarter) and El Raval. There are hundreds of vendors and a handful of unassuming (but delicious) food stalls for a quick bite. It’s open everyday, 8 AM – 8:30 PM. Live like a Local in Barcelona! Located in the elegant Passieg de Gracia neighborhood, Pedrera is a 2-bedroom apartment within walking distance of the Gothic Quarter (Las Ramblas and La Boqueria). Access to bus and metro lines is 100 meters away. French doors open onto a small terrace—a perfect spot for breakfast or an aperitif. The daily Campo dei Fiori market (held everyday except Sunday in the center of Piazza Campo dei Fiori) is Rome’s oldest. There has been a market in this location for centuries. It offers the best fish and bread in the city, as well as picturesque piles of fruits and vegetables, flowers, and fragrant ethnic spices. You can also find kitchen wares, linens, and toys. We suggest you visit early (the market opens at 6:00 AM), before most tourists are out and about and the majority of customers are Romans. Live like a Local in Rome! Piazza Campo dei Fiori is just a 2-minute walk away from Antonius, a 2-bedroom apartment (sleeps 4-6) in a restored 18th century building. Imagine taking a pre-breakfast stroll to the market for fresh fruit and bread! Also within convenient walking distance are the Pantheon and Trevi Fountain. 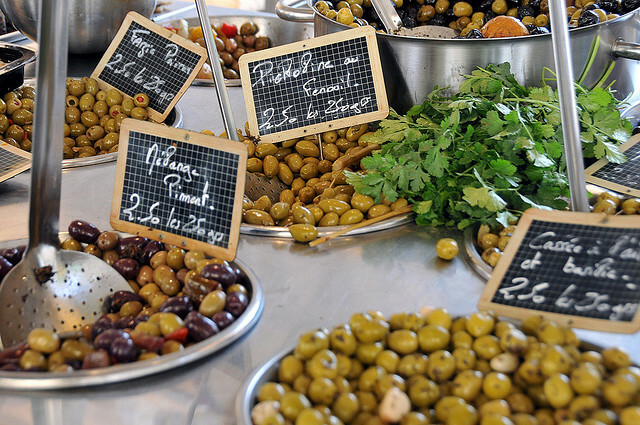 The daily market on Plâce Richelme overflows with the abundance of the Provençal countryside. For locals, shopping at the market is a daily ritual. As with all farmers’ markets, plan on visiting early when selection is at its best and your fellow shoppers are natives, not tourists. The Plâce Richelme offers beautiful, locally grown fruits and vegetables as well as cheese, bread, cured meats, and some of the best olives you will ever taste. Live like a Local in Aix-en-Provence! Maison Perspicace is just 5 km from Aix-en-Provence in the village of Les Milles. It has 4 bedrooms (sleeps 7-9) and a beautiful swimming pool—ideal after a full day trip to Marseille (30 km ) or Avignon (90 km). Shopping for fresh produce in Italy! One of the great delights of staying in an Italian villa is the opportunities you have to shop for fresh produce. 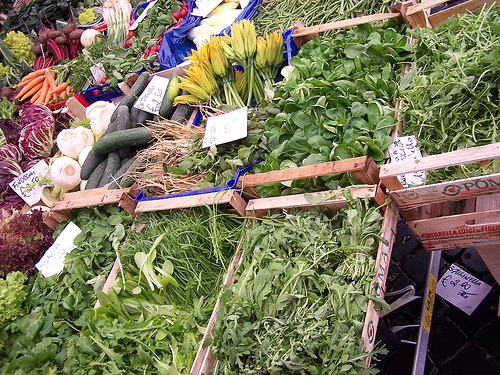 Virtually all towns in Italy have an outdoor market, usually once a week (ask around to find out which day). 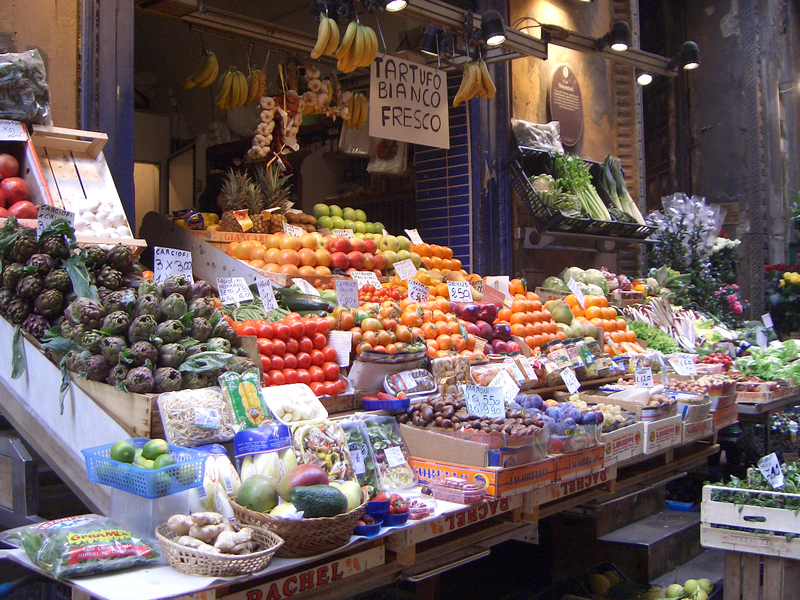 But regardless of whether you’re at a market, a small grocery, or a supermarket, there is just one rule to remember when shopping for food in Italy: DO NOT TOUCH THE PRODUCE. We’re quite used to handling our apples and oranges in the US, but in Italy it is considered very rude! In an outdoor market, you should indicate which fruits or vegetables you need, and the seller will pick out the best specimens for you. Don’t try to indicate that you don’t, for example, want that slightly green lemon – picking out produce is a point of honor for sellers, and rejecting his/her choice is an insult! Another thing to note about open markets in Italy is that there is no bargaining. In Italy, a price is a price. In a small grocery, you still can’t touch the produce! Instead, wait until an employee comes to help you. Indicate you choices and the employee will pick the produce and put it in a bag. If you really need control over your produce selection, try a large supermarket: here you will be provided with plastic gloves so that you can pick your own fruits and vegetables. Weigh each bag and punch a button for that particular item, whereupon a machine will dispense a sticker that you should put on the bag before taking it to the checkout line. Another great place to pick up some traditional Italian food is a deli. There are no special rules here (although you might have to “take a number” or wait in line). Pick up delicious marinated meats, prepared olives, artichoke salads, roasted peppers, fresh mozzarella, and everything else you might find at a full-service American deli – only better!